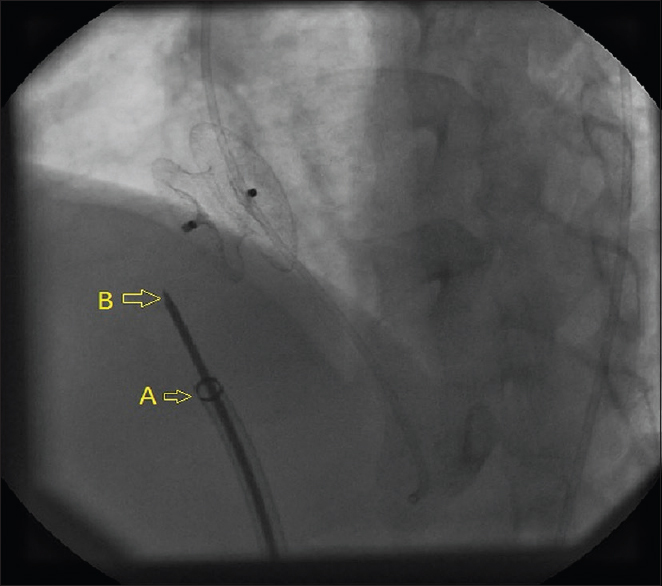 The technique for percutaneous closure of atrial septal defect (ASD) is well described and has significantly improved since its inception. If the technique is strictly followed, the transcatheter closure may be safer than surgical closure of ASD, with successful acute closure in 97–100% of patients with a complication rate of <5%. Complications include atrial arrhythmia (2–4%), device embolization (3.5%), and pericardial effusion (0.5%). Cardiac perforation is perhaps the most worrisome complication as it can sometimes occur many months to years after the procedure. One of the reasons for acute on table perforation is related to the delivery cable of the device. In our case, an 18-year-old boy who underwent successful transcatheter closure of ASD of size 18 mm using an Amplatzer ASD occluder of size 22 mm. He developed tamponade which was tapped successfully under fluoroscopic guidance. Retrospectively, we could clearly delineate that the pointed end of the delivery cable was quite far cephalad from delivery sheath just after the release of the ASD occluder [Figure 1] and [Video 1]. It is likely that the pointed end of delivery cable had perforated or created a small tear in the wall of right atrium. We feel that this a preventable complication needs to be highlighted so that the operator take necessary precautions to keep the delivery sheath very close to the tip of the delivery cable at the time of unscrewing the device which should be followed by an immediate pullback of the tip of the delivery cable into the sheath. Therefore, the operator should cautiously watch the position of the delivery sheath, the tip of the delivery cable and the position of the released device during deployment in addition to a close watch on vitals. Butera G, Biondi-Zoccai G, Sangiorgi G, Abella R, Giamberti A, Bussadori C, et al. Percutaneous versus surgical closure of secundum atrial septal defects: A systematic review and meta-analysis of currently available clinical evidence. EuroIntervention 2011;7:377-85.